A traditional Sterling Silver Bracelet. Our Master Goldsmith has taken twelve precious oval shaped Australian Light Doublet Opal stones sourced from quality opal mines in the Coober Pedy region of South Australia and bezel set them in a thick chain link design in sterling silver. 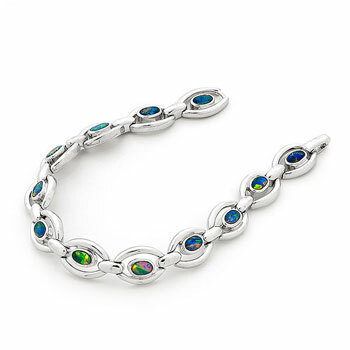 This beautiful bracelet has eye catching Blue/Green Colour stones, a great piece for a special occasion.